“Tidal Wave” is the second album from the SoFla reggae rockers and, with the addition of some new band members and instruments it ups the ante from their self-titled release from a couple of years back. Upon first listen, the first thing that I noticed was the “fuller” sound as compared to their first release, which was still quite good. 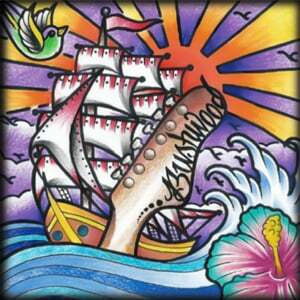 BUSHWOOD have added a sax player, a keyboardist and some more percussion to round out their funky reggae rock sound. They sound similar to bands like Pepper and Ballyhoo!, yet have a more organic vibe that draws more from traditional reggae than the rock elements that are more predominant in those bands’ sound. From start to finish “Tidal Wave” is the kind of album that you would definitely find yourself chilling out to on a hot summer day beside the pool or the grill. The first track, “Let It Flow” is an ambient almost dub number that really sets the tone for the entire album while the title track showcases the new addition to the band with a danceable reggae track that is more layered than Garfield’s lasagna. “Live Up” is the third track and presumably my favorite track on “Tidal Wave” mainly because it is a traditional sounding reggae track that has some very good horns on it and some excellent guitar work. The rest of the album continues to impress. Songs like “I Don’t Mind” and “Hold On” speed things up a little bit and showcase some of the rock elements of the band while other tracks such as “I Don’t Want My MTV” and “Top Of The Line” go old school with their rasta sound. With “Tidal Wave” I can definitely hear a band that is growing into their sound. While their first release was good, “Tidal Wave” is a major step up in both musical sound and songwriting. There are some thoughtful and progressive lyrics that really stand out and make you think. I look forward to hearing what is in store for BUSHWOOD in the future, which undoubtedly should be a bright one. Bottom Line: : A reggae rock album that leans much more to the reggae side, but with a modern sound. Fans of the Supervillains, Pepper or Ballyhoo! will enjoy “Tidal Wave” while anyone looking for a solid reggae album should have no problems diving right in.